As some among you may recall, The New Yorker used to run a little column-filler captioned “The Mysterious Orient.” Probably politically incorrect nowadays, this would cite humorous journalistic misunderstandings of the ways of the West by our Asian brethren. With permission, let me gently misapply the term to the mysterious beginnings of Huang Ruo’s first opera, Dr. Sun Yat-sen, whose American premiere just happened at the Santa Fe Opera. Four years in the making, the work was commissioned by Opera Hong Kong to be both a centennial commemoration of the 1911 Xinhai Revolution that overthrew China's imperial Qing dynasty and established the Republic of China as well as a tribute to Dr. Sun, historically the founder of the Republic. The opera was to have premiered in Beijing in September 2011, then to have subsequent performances in Guangzhou and Hong Kong. Mysteriously, inscrutably, suspiciously, authorities "postponed" Beijing and cancelled Guangzhou, but the Hong Kong premier went on as scheduled in October. Let me then be blunt, scrutable and absolutely unmysterious: SFO's production of Dr. Sun Yat-sen marks the company's finest venture thus far into 21st century opera. 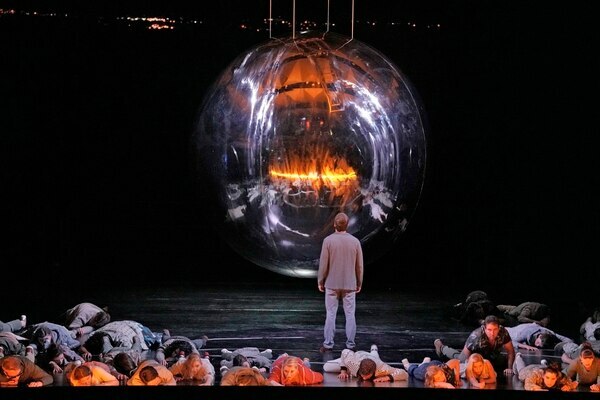 Musically and visually, it ranks high among all the many contemporary operas ever mounted here. These performances offer a stunning demonstration of Huang's skill in molding Eastern and Western modalities into a successful theatrical synthesis. A probable factor in the abrupt cancellations three years ago would be the portrayal of Dr. Sun himself, here only partially the epic hero of the revolution rather than the cardboard agitprop figure the censors might have preferred. Candace Mui-ngam Chong's libretto focuses largely on Sun's humanity, on his love for Soong Ching-ling despite his previous arranged marriage and on the consequent anger of Charlie Soong, Ching-ling's powerful father and erstwhile chief supporter of the revolutionary cause. Huang's score, although through-composed, is a numbers opera at heart; arias, duets, ensembles follow a traditional pattern in what amounts to a brilliantly untraditional context. Granted, its libretto describes a love story with operatic precedents galore. The ecstatic Sun/Ching-ling duet closing the second act recalls Mimí and Rodolpho's scene concluding act one of La Bohème. Charlie Soong stands, sort of, in the line of Verdi's unhappy papas. Lu Muzhen, Sun's first wife, forbearing and forgiving, brings to mind countless forsaken operatic heroines. But it's the depth and rich complexity of that score, presenting a deeply felt affair of the heart instead of extravagant exoticism, that makes Dr. Sun Yat-sen unique among all those distressing Western musical chronicles of broken-hearted Asians. Here, unconventionally, a happy ending arrives for the lovers and, one hopes, for the nation. Huang's orchestra plays a major role in, well, orchestrating that action. The composer prepared two instrumental versions of the opera. One, featuring an all-Chinese orchestra, premiered in Hong Kong; the present version, for a Western orchestra augmented by a few Chinese instruments and intended for Beijing, had never been heard previously. 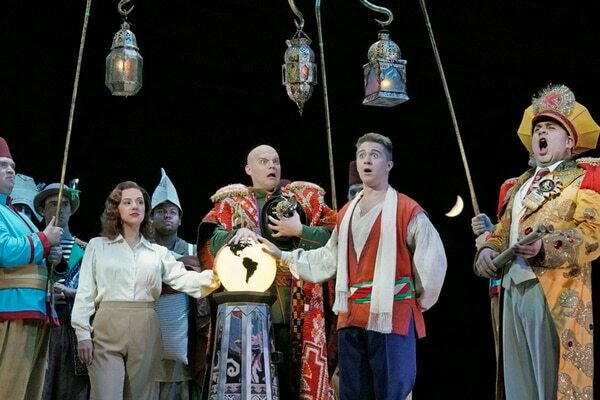 SFO's general director, Charles MacKay, correctly dubs his production a de facto world premier, especially since the libretto has received substantial revisions since Hong Kong. Does the opera sound "Chinese-y?" Not at all, in any artificial or mechanically pentatonic sense. Huang employs plenty of percussion (not much of the clash-and-slash Beijing Opera variety) and a pipa and bamboo flute and, to great effect during Ching-ling's poignant "miscarriage" aria, the guzheng or Chinese zither. But you're more likely to hear hints of Copland (lots of brass) and William Schuman and even Bernstein, especially in the knock-'em-dead overture. Often the large orchestra provides an iridescent drone to support the vocal line. There's even a brief, sumptuous string ensemble that recalls the opening sextet from Strauss' Capriccio. But the score is all Huang all the way, mostly lyrical, entirely fresh and totally convincing. He's said that while composing he sings every line; you'll hear it in the natural movement of his voices. While our Mandarin or Cantonese may be a bit rusty, Huang's musical language provides all the emotional nuance we need. Joseph Dennis, a lanky Texan and second-year apprentice artist, assumes the title role to fine effect. He's fearless in some stratospheric passages, has the requisite warmth for his intimate duets with Ching-ling and possesses enough charisma to be a convincing Dr. Sun. As his partner, company debutante Corinne Winters, commands the stage in her two powerful arias and elsewhere; it's a glowing voice, vibrant and colorful. 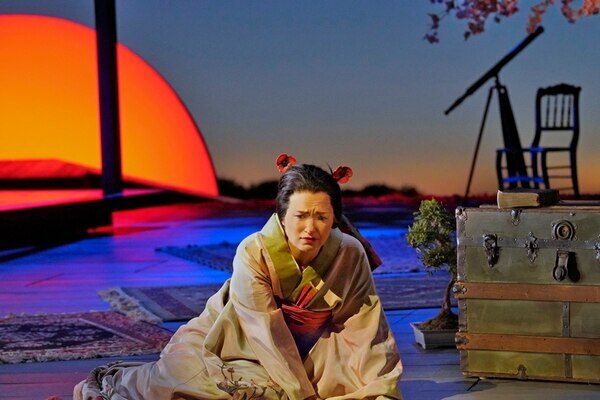 As her father, Charlie Soong, Gong Dong-Jian is a soundly sung, solid stage presence. MaryAnn McCormick makes an equally effective impression as Ching-ling's mother. Singing Mr. and Mrs. Umeya, Sun's Japanese protectors, Chen Ye Yan and apprentice Katherine Carroll provide a vivid presence. Another talented apprentice artist, Rebecca Witty, breaks the heart as that abandoned first wife. Did I mention that this large-scaled show looks mighty good? James Robinson's adept, straightforward stage direction is easily the season's best; ditto goes for Allen Moyer's scenic design, elaborate bamboo scaffolding that suggests the nation a-building, sensitively lit by Christopher Akerlind. I wish a few of James Schuette's wonderful costumes could, harrumph, migrate into this season's Le Rossignol. Susanne Sheston is the ever-reliable chorus master, and Seán Curran's five gifted dancers' miming and movement contribute essential elements to the action. Nota bene: Only three performances left. I'll say no more.